Remarks by Ruchira Gupta, Founder President of Apne Aap Women Worldwide (www.apneaap.org), at seminar on “A Human Rights Approach to Combating Human Trafficking: Challenges and Opportunities. Implementing the Recommended Principals and Guidelines on Human Rights and Human Trafficking,” organized by the United Nations Office of the High Commissioner for Human Rights at the Palais des Nations, Geneva, Switzerland on 27th May 2010 http://apneaap.org/founder/speeches/human-rights-approach-combating-human-trafficking This is a powerful statement of reality. Her presentation raises issues regarding prostitution, etc that GS must consider and evaluate within our own policies and programs. The theme of this year’s observance is United against hunger, chosen to recognize the efforts made in the fight against world hunger at national, regional and international levels. Uniting against hunger becomes real when state and civil society organizations and the private sector work in partnership at all levels to defeat hunger, extreme poverty and malnutrition. The theme of this year’s observance is United against hunger, chosen to recognize the efforts made in the fight against world hunger at national, regional and international levels. Uniting against hunger becomes real when state and civil society organizations and the private sector work in partnership at all levels to defeat hunger, extreme poverty and malnutrition. In 2009, the critical threshold of one billion hungry people in the world was reached in part due to soaring food prices and the financial crisis, a “tragic achievement in these modern days”, according to FAO Director-General Jacques Diouf. On the eve of the hunger summit, Dr Diouf launched an online petition to reflect the moral outrage of the situation. The “1 billion hungry project” reaches out to people through online social media to invite them to sign the anti-hunger petition at www.1billionhungry.org. 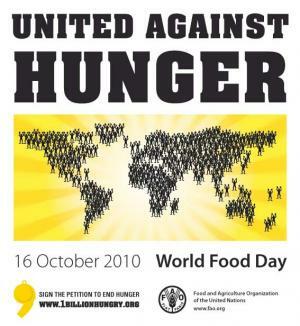 On this World Food Day 2010, when there have never been so many hungry people in the world, let us reflect on the future. With willpower, courage and persistence – and many players working together and helping each other – more food can be produced, more sustainably, and get into the mouths of those who need it most. FAO Director-General’s Message on the World Food Day/TeleFood 2010 theme: “United against Hunger”On 16 October 2010, World Food Day enters its 30th year. The theme of this year’s observance, “United against hunger”, seeks to recognize the efforts made in the fight against world hunger by all actors, at all levels; and urges us to be even more united to do more. In 2009, the critical threshold of one billion hungry people in the world was reached in large part due to soaring food prices and the global economic crisis. The gravity of the silent hunger crisis is the result of decades of neglect of agriculture and under-investment in the sector. 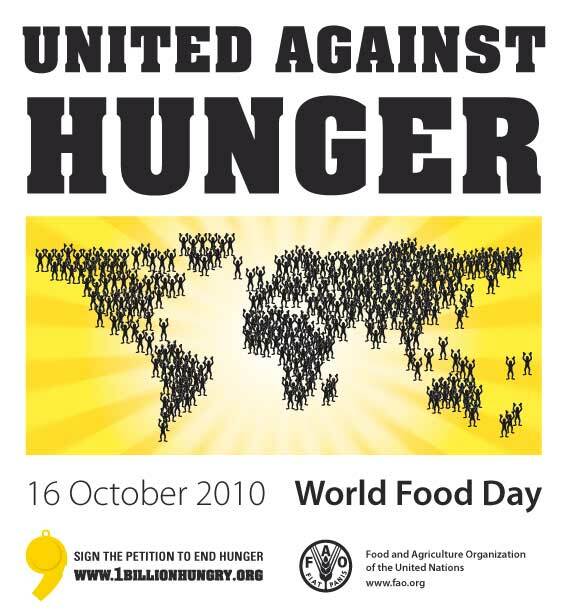 That is why on the eve of the “Hunger Summit” of heads of state and government held in Rome, in November 2009, FAO launched a petition to reflect the moral outrage of the situation. This “1 billion hungry project” reaches out to persons to sign the anti-hunger petition and to work together to amplify the message that society has to take special care that no one goes hungry today. Over 1 million people have signed and the project is continuing. FAO has united with the popular world of professional sport. Together with the European Professional Football Leagues (EPFL) and other regional football leagues, a 2nd Match Day against Hunger will be organized in Europe from 22 to 24 October 2010 as part of the Professional Football against Hunger Solidarity campaign. The theme “United against hunger” highlights the need to launch a new green revolution, while emphasizing that the task of increasing food production is a job for everyone as is the goal of ensuring access to food. Partnerships with governments, research institutes and universities, financial institutions and regional development banks, farmers’ organizations, pressure groups, the UN system, civil society and the private sector are needed to work together to achieve food security for all. World food production will need to increase by 70 percent to feed a population of over nine billion people in 2050. With limited land, farmers will have to get greater yields out of the land already under cultivation. Smallholder farmers and their families represent some 2.5 billion people, more than one-third of the global population, and it is their crucial contribution to increased food production that we want to highlight. Collaboration among international organizations plays a key strategic role in directing global efforts to reach the international hunger reduction goals. It is only by working together that we can realize our common objective. In the reformed Committee on World Food Security (CFS), the UN system, member nations, representatives of civil society, farmers’ organizations, the private sector, as well as international agricultural research institutions and international and regional financial institutions offer an inclusive international platform for policy convergence and the coordination of action and expertise in the fight against hunger in the world. On this World Food Day 2010, when there are an estimated 925 million hungry people in the world, let us reflect on the future. Agriculture and food security are finally back to the international agenda. And, with political will, determination and persistence, more food can be sustainably produced and adequately distributed. United we can defeat hunger. Thank you. This survey is giving you an opportunity to express your opinions. If you do not know of the Resolution promoting Social Integration well you may be sure that others don’t either. So read the resolution http://www.un.org/esa/socdev/csd/2010/resolutions/social-integration.pdf and become aware of the changes that the Member States (your country included) agreed to make for a better society in 2010 – poverty eradication, people participation, gender equality, the elimination of discrimination, abuse and violence. Do you think it is worth working for these changes? If you say yes, what should we do? You have an opportunity to bring your voice on behalf of persons living in poverty, persons who are excluded, women and children who are discriminated against, experience violence on a daily basis, are forced to migrate, are trafficked, are oppressed by abject poverty – you have the opportunity now to speak to the UN. This is a moment in the process when you are taking action for structural and systemic change. The United Nations has done its work saying we should have poverty eradication, effective participation, social protection, gender equality and the elimination of discrimination, abuse and violence. So why is it not happening? Why is it not being implemented? What do you think should be done to bring about change? You can complete the survey at http://www.un-ngls.org/socialintegration/en/survey.php Your answer is limited to 1,000 words.